CRISPI® BOARD LASTING - Tradition combined with Technology. The perfect connection between torsion rigidity and flexibility achieved thanks to a mechanical process that wraps the comfortable and soft part of the upper to the insole frame. CRISPI® Anatomic Fit System - Born from the concept of wrapping the foot of its full naturalness and anatomical shape, developing a sensation of immediate and long lasting comfort. The shoe becomes lighter and uniform, giving sensitivity and a better control of the foot during walking. CRISPI® Thermo Wire Technology - An innovative system developed by CRISPI® which permits to support the upper by giving extra structure, better stability, protection and support to the shoe. CRISPI® DUAL TECH LINING - When designing every single footwear item, CRISPI® pays almost fanatical attention to the dynamics of the feet while walking. Actually, it was while studying foot movements that CRISPI® has developed a new constructive technology of the inner lining that associates a kind of GORE-TEX® footwear characterized by high thermic insulation and extreme resistance to abrasion with a GORE-TEX® footwear coupled with naturally comfortable real leather. The result is 100% waterproof, breathable, long-lasting and healthy footwear products. CRISPI® WRAPPING FRAMEWORK - The W.F.W. system developed by CRISPI® is a structural over injection of a plastic polymer fused on the external part of the upper. This fusion becomes part of the shoe design. Technical Features: • Structural solidity • Lightness and comfort • Protection against external impacts • Increasing of transpiration thanks to the “Breathable areas” • Wrapping Fastening System for a perfect foot position and anatomical wrapping • Structural support on walking phase. CRISPI® CROSSBOW FRAME - C.C.F. CRISPI® Crossbow Frame brings an innovation on the shock absorbing system sole by associating the request of stability, comfort and technology in a high quality product. This insert made in plastic material follows a particular form in a waving module which offers a perfect stability, sustaining the foot and, at the same time, absorbing the shocks during the walk. Thanks to this function similar to a crossbow, this insert improves braking even in the most difficult terrains. CRISPI® A.B.S.S. - After many years of research into materials and experimentation, CRISPI® has developed a system called A.B.S.S. (Ankle Bone Support System). A.B.S.S. revolutionizes the comfort and protection of the entire ankle area thanks to a combination of innovative materials that allow the footwear to contour gently your ankle. This system offers outstanding sprain protection even on the roughest terrain whilst supporting the ankle in all conditions, thus limiting fatigue on the lower joints even after very long walks. The A.B.S.S. is a huge step forward in the manufacturing and of footwear and CRISPI® dedicates this exclusive technology development to its customers. PrimaLoft® - Primaloft insulation products offer superior performance for high quality cold- weather gear. PrimaLoft® is lightweight, breathable with excellent water repellency so you remain dry, warm and comfortable even under the most extreme conditions. VIBRAM® - The first VIBRAM sole was launched in the market in 1937 and quickly became famous all over the world for quality, performance and safety. VIBRAM® is today a guarantee to end users and the world leader in rubber soles for outdoor boots. DRY & COMFORTABLY COOL - GORE-TEX® Extended Comfort Footwear is ideal for moderate and warmer temperature conditions. Great for high- output activities and everyday use. The technology is appropriate for constant changes between indoors and outdoors, standing and walking, working and leisure time. DRY & COMFORTABLE - GORE-TEX® Performance Comfort Footwear offers optimized climate comfort for moderate weather conditions and a wide range of outdoor activities. 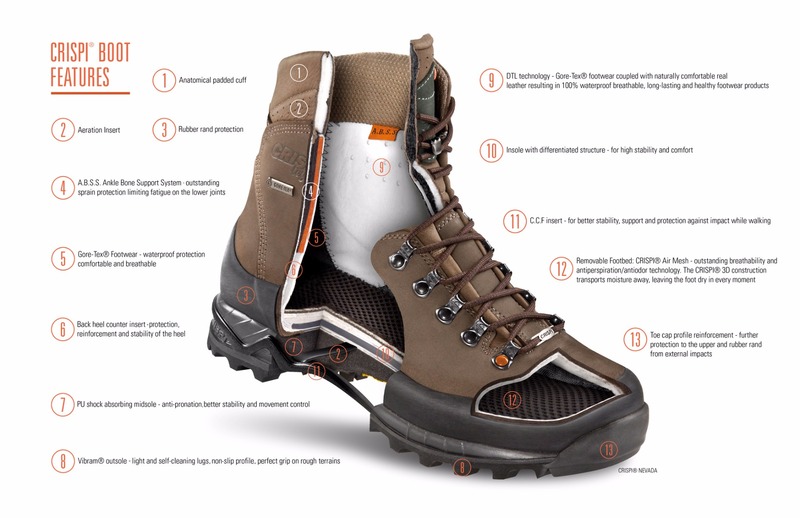 DRY & COMFORTABLY WARM - GORE-TEX® Insulated Comfort Footwear comes in a range of insulation options to keep feet dry and comfortably warm during cold conditions and winter outdoor activities.